Will Lambek, far left, and Jose Luis Cordova Herrera, center, testified in the Vermont Legislature last week. They say migrant farmworkers fear that local police will out them to Immigration and Customs Enforcement. Civil rights groups say Vermont isn’t doing enough to prevent local police agencies from helping federal authorities identify and detain immigrants who are in the country illegally. Since his inauguration in 2017, President Donald Trump has tried to enlist local police agencies in federal immigration enforcement. His push has been met with resistance in Vermont, where Democratic lawmakers and the Republican governor have said they don’t want state or local police outing migrant farmworkers to Immigration and Customs Enforcement. 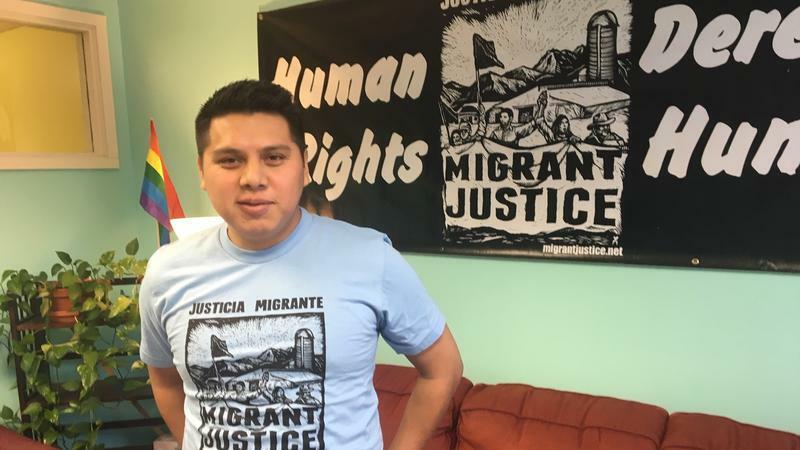 However the Vermont chapter of the American Civil Liberties Union and a group called Migrant Justice both say existing policy allows for undue collaboration between local law enforcement and federal immigration authorities. “Vermont has not done nearly enough to protect the security, the safety and the peace of mind of our immigrant communities,” ACLU lawyer Lia Ernst told lawmakers last week. Jose Luis Cordova Herrera delivered a similar message to lawmakers. Cordova Herrera has been living in Vermont for the past two and a half years. He milks cows on a dairy farm, and uses his income to pay for his kids’ education back in Mexico. But Cordova Herrera told lawmakers through an interpreter last week that long hours and grueling farm work aren’t his main source of stress. In 2017, a Franklin County sheriff’s deputy pulled over Cordova Herrera’s brother and nephew for a civil traffic violation. The deputy then radioed for U.S. Border Patrol, which took the pair into custody. They were deported six months later. Law enforcement officials say they’ve tried to address advocates’ concerns. Last year, the Vermont Criminal Justice Training Council updated what’s known as the model fair and impartial policing policy, which contains protocols followed by every law enforcement agency in the state. Will Lambek, with Migrant Justice, had hoped the policy would restrict state and local police from alerting federal authorities to the presence of people who are in the country illegally. He said that didn’t happen. “In the Trump era, the policy has been riddled with loopholes that allow officers to circumvent the intent of the policy, which is to end collaboration with immigration,” Lambek said. Richard Gauthier, head of the Vermont Criminal Justice Training Council, said the council pushed hard for language that would have restricted certain communication between local police and federal authorities. But Gauthier said the Department of Justice ruled that the language violated federal code 1373. That code, which has been on the books for about 20 years, says a state cannot prohibit police agencies from communicating to federal authorities about immigration issues. The DOJ has threatened to withhold about a half-million dollars in federal funding from Vermont as a result of the alleged breach. Gauthier said the council removed the offending language to avoid losing out on the money. “We weren’t happy about it," Gauthier said. "But we felt we needed to comply with the law." Ernst, however, said Vermont does not need to comply with that law. She said jurisdictions across the country are openly flouting 1373 and challenging the constitutionality of the law in the process. She said Vermont Attorney General TJ Donovan has filed briefs in those cases supporting its overturn. Nonetheless, Ernst said Donovan and other key officials are allowing 1373 to guide policy in Vermont. “We bend to the threat, rather than stand up for our immigrant communities, our values and our own beliefs about what best promotes effective law enforcement,” Ernst said. Donovan said the Vermont Legislature passed a state law last year that requires the model fair and impartial policing policy to be in compliance with federal code 1373. “I object to the notion that we haven’t gone far enough, because facts matter in this business,” Donovan said. Donovan said he agrees the fair and impartial policing policy should do more to protect immigrant communities. He’s even offered up legislation that would further restrict communication between local police and federal immigration authorities. But the proposed law would not take effect until federal code 1373 is overturned or nullified. And Donovan said as long as the code — and the state law requiring compliance with it — are in place, the model fair and impartial policing policy goes as far as it can go. The Vermont State Police adopted a new version of its fair and impartial policing policy in early January, according to Maj. Ingrid Jonas — but advocates for migrant farmworkers haven’t been able to see what changes the agency has made to the document. Vermont Public Radio requested a copy of the newly adopted policy, but VSP’s public information officer, Adam Silverman, would not supply it, saying it hasn’t yet become a public record. Silverman said the new policy won’t become a public record until it’s been distributed to the agency’s 300-plus members. “It's important that we follow the proper protocol and ensure those in the field receive the policy and see it first from commanders rather than news reports,” Silverman said in an email. Ernst, however, said she can’t find any basis in Vermont’s public records laws for withholding the document. Federal immigration authorities searching for people in the country illegally have found a willing partner in state motor vehicle departments, according to immigration activists. In a dozen states and Washington, D.C., undocumented people can still get a license to drive. The idea is that roads are safer if everyone using them has passed a driver's test. But that licensing process may put undocumented people at risk of deportation. Undocumented farmworkers in Vermont say they are being unlawfully targeted by federal immigration authorities for their activism on behalf of fellow migrants. Migrant farmworkers say a new policy to encourage bias-free policing in Vermont could actually end up increasing cooperation between state law enforcement agencies and federal immigration authorities. After considerable debate and numerous drafts, a new Vermont Fair and Impartial Policing Policy has been adopted.